Classical String Quartet Concert in Buckinghamshire – On Saturday 26th May the Manor House String Quartet performed a concert in Ivinghoe church entitled ‚ÄòSummer Is A‚Äô Coming In‚Äô (after the title of the well known English traditional song). We had promoted the concert by leafleting around 200 houses in the nearby vicinity. The concert also had prominent adverts in two village newsletters, as well as appearing in local newspapers and online concert diary sites. We also have a mailing list of some 50 or so audience members, some of whom have attended other concerts we have held. Despite all these efforts we only managed to get an attendance of around 35 (despite them being a lovely audience and thoroughly good humoured!). It goes to show how difficult it is to get a consistent audience for classical music concerts (outside of towns and cities). The concert itself however, was an absolute joy, with plenty of musical variety on the loose theme of summer and nature. It included two folk melodies arranged specifically for the evening by myself (‚ÄòThe Lark In The Clear Air‚Äô and ‚ÄòSumer Is Icumen In‚Äô) as well as Saint Saens‚Äôs ‚ÄòThe Swan‚Äô, Tchaikovsky‚Äôs ‚ÄòWaltz of the Flowers‚Äô, the whole of Holst‚Äôs ‚ÄòSt. Paul‚Äôs Suite‚Äô and Vivaldi‚Äôs ‚ÄòSummer‚Äô from ‚ÄòThe Four Seasons‚Äô. There were also pieces by Respighi, Schrammel and Gershwin. All the pieces were announced in a light hearted way and we had an opportunity to mingle with audience members in the interval. It was the first time in a long while that I had sweated so much in a church as it really was a hot May evening! 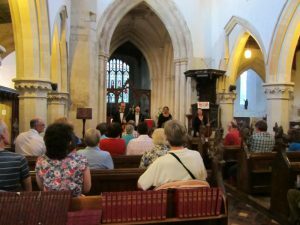 The concert ended with one encore being played and we hope to return to Ivinghoe church again in the near future.